Creating a marketing strategy solution will help grow a business through branding, marketing campaigns, and building customer loyalty. Great strategic marketing solutions will enable a company to hit their goals in far less time and with less expenditure. Marketing strategies should support a company’s overarching objectives. Many companies either don’t know how to develop their own marketing strategy, or they simply don’t have the time to focus on it. That’s when they hire outside companies to drive their business forward. Vision Force Marketing is a company who knows how to develop and implement strategic marketing solutions for all sizes of businesses. Companies need to understand that in order for their strategic marketing solutions to be successful, there are no shortcuts. Businesses need to invest time, money, and energy into creating a successful marketing strategy. This marketing strategy will identify target customers and the Marketing Plan will be developed to entice those ideal clients to purchase a particular product or service. The right marketing strategy will identify gaps in the market and have a plan to improve a company’s visibility and drive conversions. Very few business owners have the expertise necessary to write a full Marketing Plan, much less the discipline to implement a marketing strategy. 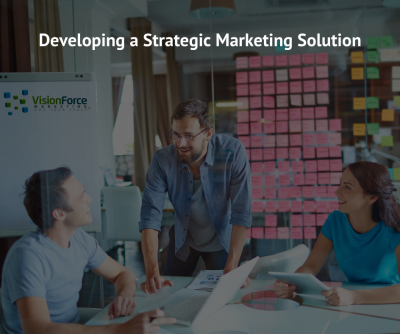 At Vision Force Marketing we do what no other marketing company does – Vision Force helps companies not only develop a full strategic Marketing Plan, we stay involved through the implementation of the marketing plan to ensure results. Be our next success story!